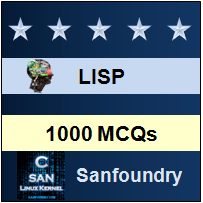 This set of LISP Multiple Choice Questions & Answers (MCQs) focuses on “Predicates – 1”. 1. What is a procedure that returns a value that signals true or false? Explanation: A predicate is a procedure that returns a value that signals true or false. 2. Which primitive tests two arguments to see if their values are the same expression? Explanation: Equal primitive tests two arguments to see if their values are the same expression. It works on atoms and lists. 3. Which predicate tests to see if its first argument is an element of its second argument? Explanation: MEMBER will return what is left of the list when the matching symbol is encountered. 4. What is meant by keyword argument? Explanation: It is used to modify a procedure’s basic behaviour along the line. 5. Which is used to produce a procedure object from a procedure name? Explanation: From procedure name to produce procedure object # is used always. 6. What is the output of the given statement? Explanation: As 4 is not equal 3, it is printing NIL. 7. What is the output of the given statement? Explanation:= is used to test two numbers only. 8. What is the output of the given statement? Explanation: Member is used to see if its first argument is an element of its second argument. 9. What is the output of the given statement? Explanation: Any symbol beginning with a colon is said to be a keyword. 10. What is the output of the given statement? Explanation: Procedure object is build from the procedure by using #, So it is printing ((MAPLE SHADE) (APPLE FRUIT)).